FatPapas Burger & Shakes restaurant has four locations in Singapore, one of which is at 17 Bali Lane. Created by FatBoy’s The Burger Bar, FatPapas Burger & Shakes offers great burgers, shakes, floats, and a taste of the rock & roll lifestyle. 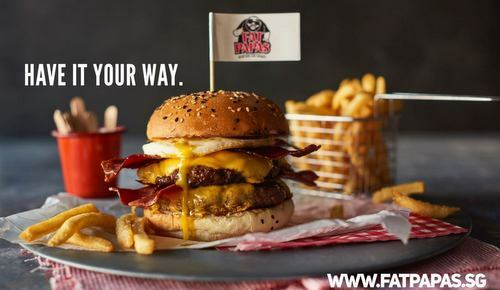 Visiting one of the locations, you’ll get to enjoy hearty American comfort food in a diner setting with plenty of options, especially FatPapas’ signature burgers. Highlights on the restaurant’s menu include The Elvis Burger (beef patty, grilled bananas, and creamy peanut butter on a honey oat bun), Bolly Wooly Burger (juicy lamb patty on a bed of lettuce, smothered with homemade curry remoulade and topped with onion marmalade on a honey oat bun), and Spaghetti Meatballs (beef meatballs in homecooked tomato concasse on a bed of fresh spaghetti). 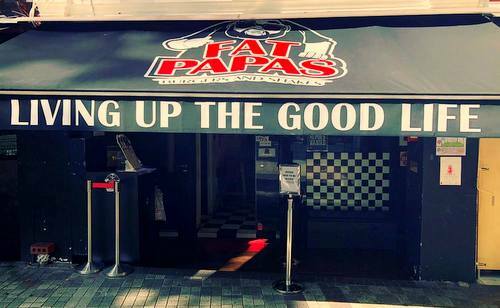 The official FatPapas Singapore Facebook brand page is available at www.facebook.com/fatpapassg/. You can also follow the restaurant chain’s official Instagram account, which in turn is located at www.instagram.com/fatpapas/.